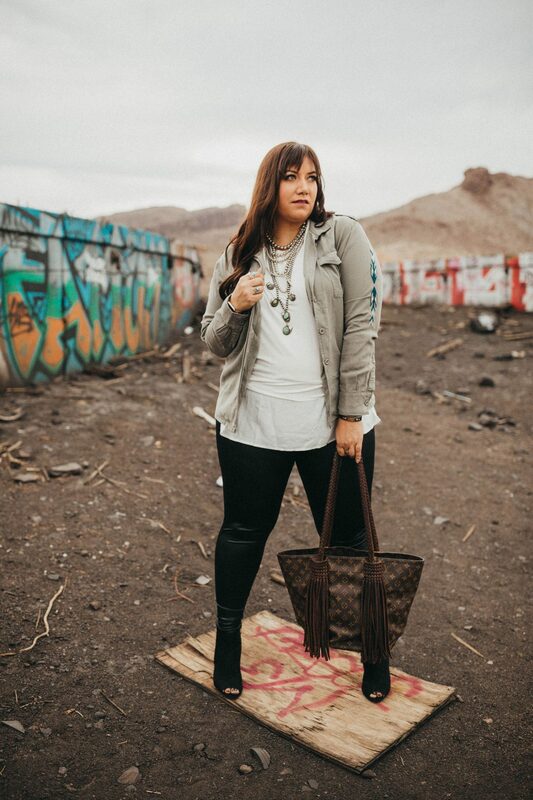 This collaboration with August Love Boutique has been such a blast! I absolutely love being able to find a boutique that carries clothes in my size, as well as clothes that are trendy and universal. These 2 fun pieces from August Love Boutique can not only be worn through the seasons but they can be mixed and matched for different looks. Let’s take a closer look at this fun striped and floral top from August Love! The answer is yes, the top part is shear with a floral design. The material of this top is nice and soft, which if you know me a soft top is always the way to go! It is definitely a top I’d wear to work. I mean honestly you can not go wrong with this fabulous shirt, I was out for a day on the town with family so I went casual when I rocked it! You can pair it with dress pants or even a great dark denim trouser pant. Honestly so many options to rock with this fun top! Next let us take a look at some fabulous Fringe! I mean what’s more fun than fringe right?! Really fringe in the wind?! Ekkk I just love it so much movement and yes I might have twirled after this shot. All and all I found quality and affordable pieces with this fun boutique. So be sure to check out their website August Love , because you deserve something special. Also stay updated by following them on Instagram and on FaceBook . Remember no matter what you wear be confident in who you are and walk in His Grace and Rock the Style. Where has the time gone? I can hardly believe it is August already! Which means hello birthday month! I am beyond excited about that! So let’s talk about a fun timeless gifts for any occasion especially, BIRTHDAYS! I have just fallen in love with these amazing watches. Have you heard of Jord? I am so blown away by not only the class and style of these watches but the build! I am always looking for a classy timeless piece to add to my everyday wear. After searching out and learning more about Jord wood watches, I found a timeless piece that I know was literally calling my name. I am pretty sure it said Hannah you need me in your life so you will quite running late!! Which for some reason this past month has just been a thing, the harder I try not to be late the later I get, eeek sorry friends! I will get better now that the Cassia is in my life! This stylish timeless piece not only matches my sense of style but it is super easy to read. Jord wood watches are not just your average watch let me do a little educating because this was my selling point for me on why I fell in love and thought I need to add one to my life stat! They first off are designed in the USA and to top that off, they are made out of reclaimed or naturally fallen wood. Now how cool is that? I was amazed about that fact, which in my mind makes them such cool gifts for birthdays, weddings, any special occasion. And with the way time flies, Christmas will be here before you know it! These watches are seriously such a fun timeless piece to have personally or give too! I love that there are styles for everyone and every personality! Fun and funky to timeless and classy! The choice is totally up to you, and for an added bonus you can get it engraved! So you can always remember those special occasions! Which makes them such great timeless gifts in my mind! So let’s recap all this…to stay looking stylish and classy even if you are like me running out the door late or running on time or even early you will look fabulous with a Jord watch on your wrist. You can even pair them with fun stacked bracelets or some turquoises of course because you know turquoise is a girl’s best friend! So do I have you drooling over these stunning pieces yet? If your answer is yes, then you will definitely want to click below for a chance to get one of your own! Click here and enter this fun GIVEAWAY for a chance to win $100 credit to get one of your very own! That way you are always stylin’ and profilin’! Remember friends and family, always live in His Grace and Rock the Style no matter what! Happy Saturday remember life isn’t always perfect but your outfit sure can be and check out these fun outfits coming at you today!!! I am so excited to show them off! I am in love with the quality of not only the clothing but the fun fit and styles! My friend Hailey reached out to me to not to long ago about the clothing she sells. I was really excited because I think Hailey’s style is awesome and I also do love her outfits she rocks. Come to find out its is Lula Roe! Now if you have never heard of Lula Roe let me tell you it is such a fun business! They have consultants like Hailey who have fun pop up shops and live sales to buy fun and quality pieces that will last you. Also that are very fashionable and cute! Sizes range from regular to plus size! These pieces can be mixed and matched or just rocked solo. For example this fun Cici Dress! It can be rocked 3 different ways and the styling on this dress is actually unlimited. You can dress it up for a fun night out or you dress it down and run to town (Looking oh so fabulous) or even rock it on that fun vacation. I guess there is the thing too called work or the office haha you can wear it. But we all know the others place like vacation is so much nicer to think about. Check out the 3 different ways you can just rock the top part of this dress. So super cute right? I am just really obviously in love with this dress. My personal favorite is wearing it on off one shoulder. Now check out these other fun pieces from Hailey’s Style Shop! Finally this fun top that I rocked on Friday! Which I really just felt fabulous in! Not only did I like the fit but I loved the colors and overall look of the tee! Really all the fun you can have with these pieces from Hailey’s Style Shop is limitless! The best part is Hailey is there to help you with whatever you need! She’s just pretty awesome! No matter what you do remember to be you boldly and always live in His Grace and your style! Hello there to all my awesome readers! I am so excited for today’s interview with Lana owner of Wesley’s aka @Wesleys.Nebraska on Instagram. Lana reached out to me before she opened her awesome business and we just hit it off! Instant Friendship! Love those connections! I thought it would be fun to do a little sit down interview with Lana so y’all can get to know her and her business Wesley’s a little better! H: Who or What inspired you to start Wesley’s? L: I’ve always loved clothes just like most girls do! I got involved in the western wear industry about three years ago with work and traveling for a couple different companies that would set up booths at stock shows and rodeos and that helped to light the embers even more on wanting to start my own boutique. As far as who; my parents have been amazingly supportive, as well as my sister and sister-in-law that have helped here and there along the way. A very good friend of mine, Sierra Jones, who runs a side business in calligraphy and created my tags for me has been a huge encouragement since before I started as well. Finally, Dustin Davis, is honestly one of the biggest supporters of this and who always pushes me to do my best and follow the dreams and goals I have! He’s been one of the biggest encouragers for me this whole time. One of the real inspirations behind starting Wesley’s was not only to start my own boutique and small business, but to also find name brand items that I could get to girls at lower prices. One of the biggest goals that I have for Wesley’s is to find some deals along the way that girls otherwise might not want to or have the money to spend on items right away. I love finding great deals on quality, name brand items, and I want other girls to have that same opportunity and help give that to them and save them a little bit of money here and there! H: Did you have to seek advice before you got started or did you just go for it? L: I did have to do some looking around as far as what I would need for supplies, a certain amount for start-up money, and other items along the way. As far as seeking other advice, I’d ordered wholesale before and had experience in that area, so I kind of just jumped after I got my ducks lined up, and went for it! There’s constantly things changing and keeping up with new items, finding deals for girls, and getting items sent out to customers. It’s all a learning process and I’m always learning new things. I love everything about this journey so far, though! H: How did you get your boutique name? L: I wanted something original and that had some meaning behind it for me, so I ended up going with Wesley’s; my grandpa’s and my dad’s middle name. I like different names and something that isn’t what people might expect being a boutique name. When I kept thinking about what I would name a business of my own, that was the name that first popped into my head and I liked the sound of it no matter how many other names I came up with that I might have wanted to use. H: What are your 2 favorite pieces in your store right now? L: My two favorite pieces in my store right now are the On The Fringe booties in ruby red by Miss Macie Boots and the Anna top [a red striped top]. I love the Miss Macie boots because they’re so comfortable, and I love adding a pop of color to an outfit! The Anna top is my favorite right now because it looks so good with turquoise layered all over it, and has a chic old school look with the vertical stripes and you can dress it up or down! H: What has been the biggest blessing about your business in your life? L: The biggest blessing about Wesley’s so far is the freedom that it’s giving me as well as the fulfillment and excitement of starting up my own small business. God has definitely helped me all along the way in this! There have been some great people that I’ve been able to work with so far, two of whom I would say are at the top of the list are; LaDane Smith and Bethany Keller of Miss Macie Boots. Those two ladies have been so kind and encouraging along the way and were so accepting of my business proposal when I first called in to open an account with Miss Macie Boots! Another blessing would be the people that have found my boutique on either Facebook or Instagram so far and that have been so kind and great to work with and that love finding deals as much as I do! H:Do you have something on your heart that you would like to share with our readers? L: Honestly, I’m pretty simple. My goals are to just be happy, own my business and have it grow into something that girls love shopping online to find something they love and possibly snag a few deals along the way! I stay super busy and I help out my family on our farm/ranch operation in Nebraska, I work part-time on transcription, and I’m currently seeking the corporate workforce again since finishing college. I love to stay busy and Wesley’s is helping with that and helping fill the dreams and goals I have. I know that I may not be one of the “it” girls on social media with the best photography, the most followers, or the most likes; I’m willing to work as hard as I need to for all of that though and build my way up to having a great website to give great customer service to girls looking for that new addition to their closets! I love seeing people happy and knowing that I helped give someone a little joy in finding something they love. It’s all a process and it takes money to build up to something bigger, and eventually better; I know that nothing like that happens over night, but I’m so excited for the future and seeing what else I can do with Wesley’s! H: Anything fun and exciting coming for Wesley’s these next few months? L: For right now, I’m still working on bringing in more inventory, finding some sweet deals along the way to add, and also hopefully being able to add a website before the end of the year! Lana thank you so much for sitting down with us and letting us get to know you and Wesley’s a little better! I am beyond thrilled for you and your new journey! I am personally already in love with Wesley’s and to get to know the story behind the boutique and owner makes me love it even more! If y’all haven’t yet be sure to check out Wesley’s on Facebook and Instagram! Links are below! Remember readers to always believe in yourself and your dreams, God is your biggest fan and He’s cheering you on and so am I! Keep styling in His Grace and your awesome Style! Also be in the know and Join Wesley’s VIP Group! “Accessories are the exclamation point of a woman’s outfit.” -Michael Kors. Oh how true does this statement ring. I love accessories and I never quite feel complete until I have them on. It’s just the finishing touch that gives you that little extra oomph. I happened to meet this sweet business owner Beth with Rustic Rose and I fell in love with her pieces. Her pieces just fit me and my personal style to a tee, I can wear them to dress up or just for every day wear. I did a fun little sit down Q&A with Beth so y’all can know more about her and the face behind the brand! Twenty-one year old Beth was born and raised in Hanna, Alberta. She now goes to school at Medicine Hat College where she is actively involved in student leadership. Beth enjoys baking, riding horses, and hunting in her spare time. Let’s Get This Interview Party Started! H: How long have you had Rustic Rose? B: I started Rustic Rose in April of 2015, so about three years. H: What or who inspired you to start Rustic Rose? B: Some of my girlfriends and I were getting ready to go to a local rodeo and dance. We started planning our outfits out a few days ahead and we all struggle to find western jewelry that was within our “poor-college student” budgets. I just decided to try my hand at making some jewelry so I went to a local craft store and got a few turquoise beads and pendants and made a necklace. I wore it out and later posted a picture on social media of me wearing the necklace. Before I knew it I had family and friends asking where they could get the necklace. Here’s the beginning of Rustic Rose. B: I just went for it! I kind of stumbled across the business idea so in the beginning I just made jewelry for friends and family. When word started getting around I made a Facebook page and things progressed from there. B: Turquoise studs- they go with everything! Taupe rosary necklace with extra long fringe. B: The support I receive from friends, family and strangers. Without them I wouldn’t have a business. H: Anything fun an exciting coming for Rustic Rose these next few months? That is so beyond exciting Beth, I am beyond pumped for you!!! Thank you for taking the time to do a little sit down with us and letting us get to know you a little more! To check out Rustic Rose and all of Beth’s fabulous creations CLICK HERE! Just so you know her prices super affordable!!! Remember to live in His Grace & rock your Style! Who doesn’t love vintage neon motel signs? Especially when they are along the famous Route 66! I love how fun this tee is and of course soft!! I edged it up but you can dress this tee up or down! I am seriously in love with all these tees from Pradera. The Pradera Style is live all your days in color. Always searching for something cool, something funky and eclectic with a kinda Cowboy feel! So I think that yes I’m in love with these tees!! Remember to always be brave, be bold and be you!! Love life in His Grace & Style! Did you know in July 30, 1956 President Dwight Eisenhower’s approved and declared “In God We Trust” must be put on all American currency? It is a phase most all of us use finding our hope and trust in Him. Sometimes when I think back on history it blows my mind the faith, hope and trust the settlers had to have. They had to trust in God they would find better than where they were. That’s so true these days too. If we trust in God and all his promises and seek Him first great and mighty things can happen. That’s part of why I love this phrase so much and so honored to get to rock this tee. Just 4 words make up 1 powerful phase and mantra. Proverbs 3:5-6 says, “trust in the Lord with all your heart and lean not on your own understanding in all your ways acknowledge Him and He will direct your path.” If you live by this or need that soft reminder this tee is for you!! Click here to get yours ordered! Use discount code Hannah10 at check out to receive 10% off as well! Remember trust in Him and let Him guide your steps. Be confident in who God created you to be dare to be bold. Live life in His Grace & style!